a worldwide ministry with headquarters in Lancaster, PA.
30% of the sale of the following canvas print will go to Global Disciples. at Gallery:$975. To purchase this option, please call the Gallery. 50% of the sale of the following prints and note cards will go to Global Disciples. In addition to the sizes listed below, there are other sizes available, including custom sizes if you wish. For those, please contact the Gallery. SCROLL DOWN BELOW STORY FOR CHECK-OUT. “When I first got on the plane in New York to leave for Israel and before it was ready to taxi out to the tarmac, I got a call from a friend who wanted to pray for me and the trip. In the midst of the prayer, she interrupted and said, “The Lord says that He is going to download an image while you are in Israel for you to paint”. I thought that the word “download” was an interesting choice for God to use, but I pondered it in my heart and thanked her for the prayer and specific word of promise. During my travels throughout Israel I was artistically inspired to create paintings for my show from the Holy Lands, but I couldn’t say that I had any “ah-ha” moment where I knew God was giving me a specific image to paint. The last 4 days in Israel were spent in Jerusalem where I stayed at JHOPFAN (Jerusalem House of Prayer for All Nations) at their location on the Mount of Olives. While I was there two women came up to me and told me that the Holy Spirit had told them that they should anoint my hands with oil and pray over them because God was going to download images that He wants me to paint. Two different parties on two continents, unaware of each other, used the same verbiage and spoke the exact same message. That evening without warning and without me even thinking any more about the prayer earlier in the day, this image of “The King Has Come” came crashing into my mind. I was not having a vision, but I received such a clear mental picture that I had to stop what I was doing and quickly grab some paper to write down all the details I was seeing. Then early in the morning I woke with a start at 3 AM, with more details coming into my mind for this image. Finally, the next day when I was sitting at an outdoor cafe, again more details came crashing in and I had to stop and write it all down. Three times within 15 hours God did, indeed, quite dramatically “download” an image for me to paint. 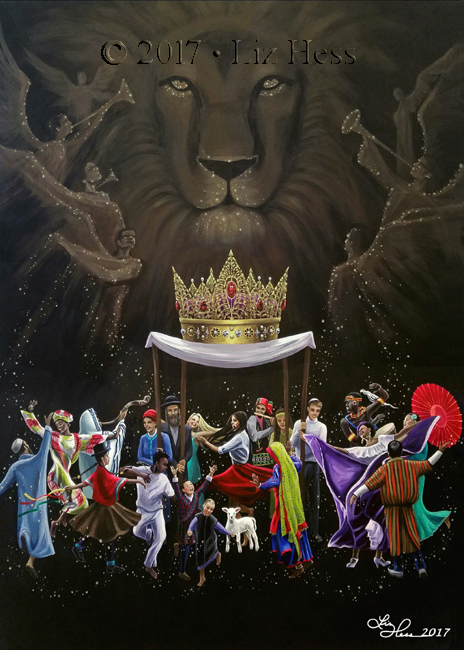 One of the specific things I saw when this image came to me was that Jewish people have to be the 4 holding up the beams of the chuppah (canopy) and crown, for it is through them that all nations of the world can celebrate the arrival of the King who has come for all. Later, at home in the quiet of my painting studio, the title also came “crashing” into my mind without warning. I was not thinking about a title, only focusing on applying the paint to the gold crown which I happened to be painting at that very moment. Suddenly, as clearly as the image had arrived without warning, the title also arrived, “The King Has Come”! As I reflected on the word, “download”, and why God chose to use it, I realized that it means to transfer a completed file or image from either the internet or a file to your device. I can say with confidence that I am not the creator of this image. It was already created in Heaven and simply transferred for me to apply onto the canvas. SKU: N/A. Categories: Christmas, King of Kings & The King Has Come, Red Umbrella Collection, Sacred Collection.